San Francisco (AFP) - Flush with a reported $5.5 million in fresh funding, upstart social network Ello on Thursday legally changed its corporate standing to back a promise to remain ad-free. Ello converted to a public benefit corporation, which it described as "a new kind of for-profit company in the USA that exists to produce a benefit for society as a whole — not just to make money for its investors." The announcement posted at Ello's website came as word spread that venture capitalists pumped $5.5 million into the company in a fresh funding round. That money will be used in part to beef up capacity so the social network can be opened to more users. 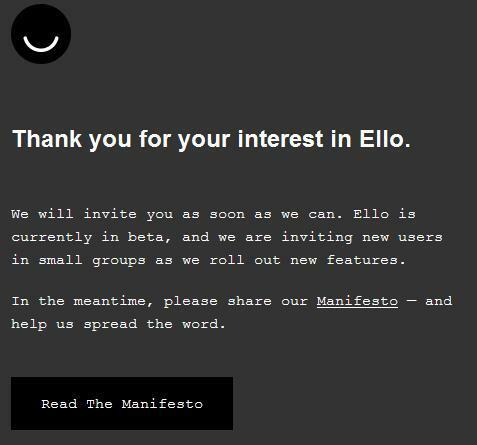 Ello, described as the "anti-Facebook" for its stand on privacy and advertising, has become a hot ticket on the Internet. Created last year as a "private" social network, Ello (www.ello.co) recently opened its doors on an invitation-only basis. Ello appears to have caught on with its simple message which seems to take aim at frustrations of Facebook users. Facebook has been criticized by some users over its privacy policies and ads that use personal information. "Ello doesn't sell ads. Nor do we sell data about you to third parties," the company says. Its "manifesto" states: "We believe a social network can be a tool for empowerment. Not a tool to deceive, coerce, and manipulate -- but a place to connect, create, and celebrate life. You are not a product." Ello's policy states that the practice of collecting and selling personal data and mapping your social connections for profit "is both creepy and unethical." "Under the guise of offering a 'free' service, users pay a high price in intrusive advertising and lack of privacy." Based in Vermont, Ello was launched by a group of artists and programmers led by Paul Budnitz, whose previous experience includes designing bicycles and toys. Budnitz says on his page that Ello was designed to be "simple, beautiful and ad-free." It remains unclear if Ello can develop a profitable business plan without advertisements. Ello states it plans to remain "completely free to use," but that it could start offering some premium features for a fee.